The eighteenth Lecture takes place on Thursday 11th October at 7:30 pm in St. Andrew’s Church, Bilston Street, Sedgley. On this occasion Trevor Genge will present personal reminiscences about The Life and Times of Andrew Barnett. Andrew was one of Trevor’s teachers at junior school and much later they were co-founders of the Society. Andrew recorded and researched Sedgley Manor over many years accumulating extensive notes, sketches, photographs and artefacts. His desire for preserving Black Country memorabilia culminated in the opening of Sedgley Local History Museum in November 1988. The evening will appeal to people who knew Andrew as headmaster of Red Hall Junior School in Lower Gornal, students who attended his local history courses and the many friends who shared his passion for local history. As usual visitors are invited to come along. Individual talks cost £1 or take a full year’s membership - a bargain at £4 with free access to the programme of talks. The Society’s recommendation for a summer visit is The Black Country Living Museum. Numbered among the ever increasing reconstructed buildings are four that once stood in Sedgley Manor. The photograph shows one of these. Where was its original location? What purpose did it serve? 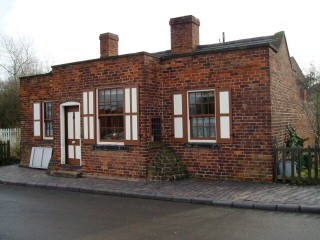 The Littleworth Toll House, built in 1843, once stood on the north side of Sedgley Road nearly opposite Holden’s brewery. Through this part of Woodsetton, still known as Swan Village, ran the Sedgley to Tividale turnpike. Tolls were only collected for about thirty years, but the cottage was lived in until late in the C20th. The Black Country Living Museum has furnished the rooms as they were around 1920.